The first accredited course of orthomolecular medicine was held on October 6, 2017 in cooperation with the Institute for Sport and Physical Culture Serbia. 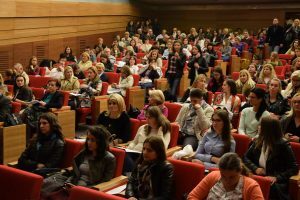 In spite of the very bad weather, over 300 doctors and pharmacists from all over Serbia came to the Dedinje Parliament club. Visibility and interest in this topic were indeed beyond all expectations. Dr. Danijela Draskovic Radojkovic, Endocrinologist from the Medigroup General Hospital, Dr. Marijana Šašić, gynecologist from the special VTO hospital Belgrade and Mr. ph. Dragana Ilić have been invited as guest speakers. Each from it’s perspective and from it’s experience has presented the notion of orthomolecular medicine and the importance of prevention with the help of dietary supplements based on it. Dr. Draskovic talked about a new approach to the patient as a whole. Not through observing the disease individually, but as a whole organism, in terms of emotional and physical being, on which integrative medicine is based. As a specialist in endocrine medicine, in conclusion of her lecture, she stated what is important for preserving good health, and in the first place is adequate supplementation with Orthomol preparations.